Age proves to be one of the most important factors to consider when looking for online services. This is because in the fast-paced world of the internet, only a few brands are able to stand against the test of time. And yes, the older ones are examples of those that have survived, and are as well those that you can actually trust. If you are looking for a webhost service that is known for its brand longevity and steady stream of clients, then check out IXWebHosting.com. This web host service provider has been in the business since 1999, and while it prefers to lay low in the market, it knows how to get the right clients to purchase its packages, thus throughout the years it has been capable of bringing the best quality service to its customers. IXWebHosting.com offers two kinds of web hosting, Linux and Windows. This is actually a big deal because most of today’s web host service providers still offer Linux only hosting; having the Windows package option can cater the needs and preferences particularly that of bigger websites. IXWebHosting.com also offers several features, such as unlimited disk space, unlimited domains and unlimited bandwidth. Clients are given enough room to build, upload, test and polish everything their website needs in order to run online smoothly and seamlessly, and not deal with just what’s available like that in other hosting providers. Another important feature found in IXWebHosting.com is a free website builder, which is essential for online entrepreneurs who are starting from scratch. Customers who are looking forward to build and run their website live on their own may also make use of the installations included in the hosting package they purchased, as these are very userfriendly. Ecommerce installations. Ecommerce plugins are essential for websites that will cater to B2C and C2C industries, and without the right tools owners will not be able to sell their products their services properly. IXWebHosting.com understands this need, thus all its packages come with free ecommerce tools that can be installed during or after website buildup, so that they can start functioning once the website goes live. Minimal system downtime. What made IXWebHosting.com a popular name in the industry of web hosting services is the fact that it is capable of rendering quality online hosting with the least downtime problems. Downtime moments can create a big mess especially in ecommerce websites, as these may result to unprocessed and missing payments, disrupted relay of essential data for daily business operations, and other issues that may lead up to losing profits for the company. Cloud hosting. 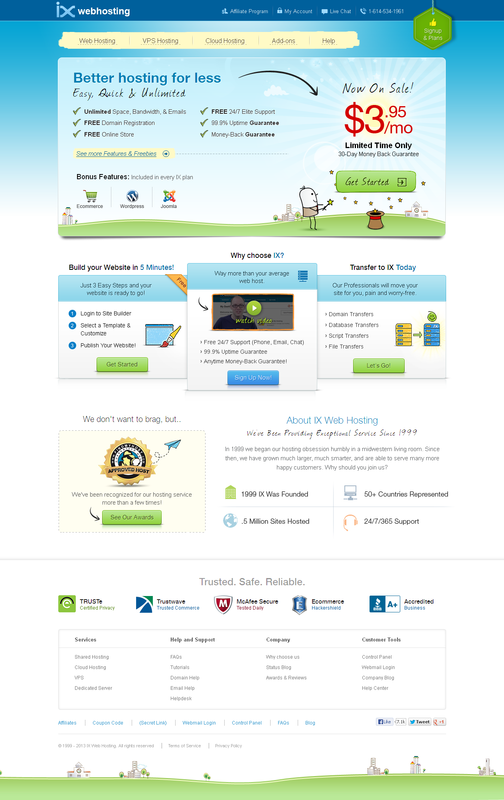 Just recently, IXWebHosting.com started to provide cloud hosting to new clients. Through cloud hosting clients are able to fulfill the needs of markets through mobile sharing and viewing, which is currently not available yet in other hosting providers. 99.9% Online network service. IXWebhosting.com is one of the most stable hosting providers today. According to user reviews, this hosting provider is capable of avoiding downtime issues and informs its clients beforehand when downtime procedures are necessary (especially when they are updating their servers). Expert. The Expert Package costs $3.95 a month, comes with unlimited bandwidth, email accounts and disk space, 2 dedicated IPs, 1 domain registration, and ecommerce features such as online store, shopping carts, web design services and ecommerce tutorials. Unlimited. The Unlimited Package costs $7.95 per month. It also comes with unlimited bandwidth, email accounts and disk space, 15 dedicated IPs, 3 domain registrations, and ecommerce features. Business. The Business Package also costs $7.95 per month, includes unlimited bandwidth, email accounts and disk space, ecommerce features, 3 dedicated IPs and 2 domain registrations. VPSX4. This package costs $54.95 per month, comes with a dedicated 4×2.4Ghz dual core CPU, 768 MB of RAM, 50GB disk space, and 1500 bandwidth. VPSX8. The VPSX8 package meanwhile costs $89.95 per month. It comes with a dedicated 8×3.4Ghz dual core CPU, 2048MB RAM, 100GB disk space, and 2TB bandwidth.All packages come with a 30-day money back guarantee. While it is one of the most reliable web hosting service providers today, IXWebHosting.com has proven itself susceptible to certain malicious attacks during the recent years, just like many other hosting providers. The good thing about this is that it is quick to respond to customer problems, and makes it a point to update their systems regularly to seal such as attacks whenever they take place. One of the strongest points of IXWebHosting.com is its customer support team, which can be contacted via phone, chat and email on a 24/7 basis. Its customer service team is quick to respond to customer complaints, and provides solutions right away. Their customer service team is also commendable because it keeps customers in the loop while finding resolutions to their problems. Many customers appreciate the work of IXWebHosting.com’s CS agents especially when they have site issues; they were constantly informed about the status of their problem until such time that the issue was finally resolved. This is a very important feature especially if you’re a customer, as you know that you are not left blind with the progress of your situation. IXWebHosting.com is one of the strongest web hosting service providers today, not only in terms of age but as well as reliability. It is a good hosting package both for startup ecommerce sites and other websites that require bigger necessities to stay online. IXWebHosting.com is also a good choice in case you are planning to set up a website on your own, as its packages come with installations that are easy to use, even for newbie web designers and site owners. You can also ask for help anytime from their customer service agents, who are available 24/7 to assist customers with their needs.